Our Oakland: walking tour: the Dimond shines! walking tour: the Dimond shines! Last Sunday was the last Oakland Heritage Alliance walking tour of the season, led by local historian and author Dennis Evanosky. A large group met in Dimond Park near the Boy Scout Hut. Long-time residents of the Dimond knew where that was, but I had to look it up, and it apparently caused confusion for a number of people. Regardless, the Boy Scout Hut was a great place to meet. 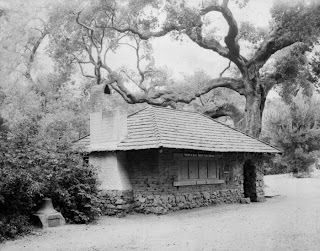 It was originally a cottage built by Dennis Dimond, using adobe bricks from the Peralta homestead. Dennis was the son of Hugh Dimond, who purchased the land in 1867. Hugh made his fortune in the mercantile and liquor trade. In 1873 he retired from business life at age 41. He decided to settle on the 267 acres he had purchased in 1867 in the Oakland foothills along Sausal Creek, an area including the Luelling spread near the cherry orchards and the hay farms. While the old Luelling house was being enlarged and refurbished for his family, he and his wife traveled in Europe. Daughter Nellie was born in Switzerland in 1873, and son Hugh in France in 1875, son Dennis back in Oakland in 1876. They moved into their new home in 1877. Eyewitness accounts say the home was an imposing two-story white wooden structure surrounded by a spacious one-story veranda. 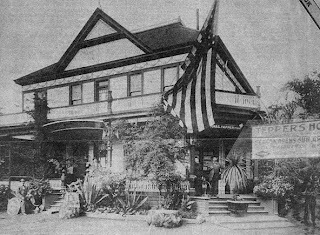 Dimond Avenue began as the carriage entrance to the Dimond place, which was situated just beyond the grove of redwood trees in today's Dimond Park. A big part of the Dimond's history is Sausal Creek (read more about the creek), from the logging of the redwoods in the upper canyon to the construction of a reservoir*, to the current state of much of the creek being underground in culverts. The presence of the creek as a water supply was no doubt part of why it was a desirable place to settle. We got more bits and pieces of Dimond history as we walked along, including seeing where one of the houses in Preservation Park came from. Our next big stop was the Altenheim senior housing. Various history buffs on the tour were excited because in the past the OHA tours hadn't gotten access, and it's on the National Register of Historic Places. An added bonus is that we had Elke, one of the residents, to show us around. From there, we walked over to the heart of the Dimond, where Fruitvale Ave. and MacArthur Blvd. meet. Along the way we saw where Sausal Creek briefly resurfaces, and the location of a former beer garden. The Dimond was home to not one but 3 beer gardens. The building where Charlie Tepper's beer garden and hotel was still stands, though other structures have been built in front of it. There was also the Neckhaus Garden, and Bauerhofer's, which featured a boxing ring and was where "toughs and their janes" hung out. But most (in)famous was the "Hermitage House". 'Gentlemen' were picked up and discreetly transported there to be entertained by "French dancing girls". There's lots more to the history of the Dimond that was covered, including the Rhoda family, how the Presbyterians kicked out the Hermitage, real estate development by F.M. "Borax" Smith's Realty Syndicate, and more. Another great OHA tour, worth checking out when it's offered again. Gene, I'm looking for your DIY blog. Is it gone? OK, mischief managed, I think. There was a DIY blogroll I had that redirected to another site. Thanks. It was the redirection that confused me, and it happened so quickly I couldn't click on anything on the sidebar.